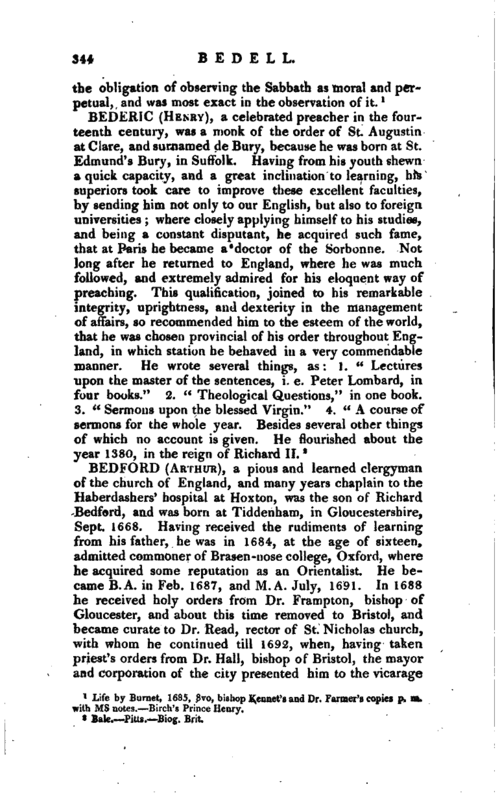 , a pious and learned clergyman of the church of England, and many years chaplain to the Haberdashers’ hospital at Hoxton, was the son of Richard Bedford, and was born at Tiddenham, in Gloucestershire, Sept. 1668. 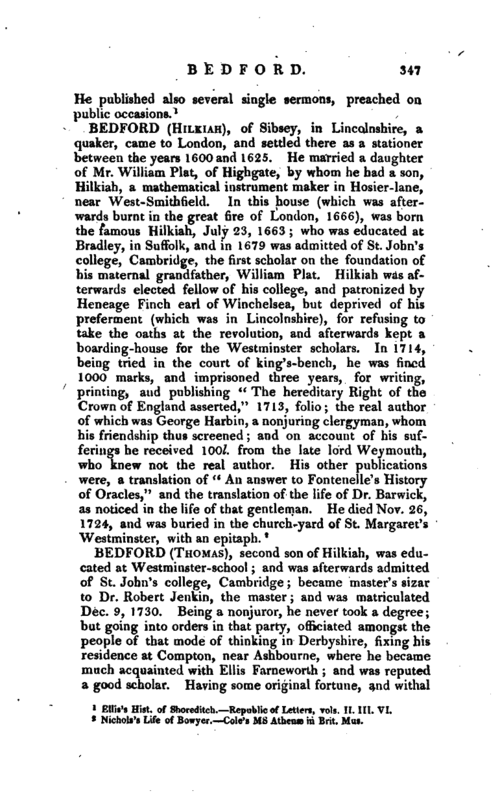 Having received the rudiments of learning from his father, he was in 1684, at the age of sixteen, admitted commoner of Brasen-nose college, Oxford, where he acquired some reputation as an Orientalist. He became B.A. in Feb. 1687, and M.A. July, 1691. In 1688 he received holy orders from Dr. Frampton, bishop of Gloucester, and about this time removed to Bristol, and became curate to Dr. Read, rector of St. Nicholas church, with whom he continued till 1692, when, having taken priest’s orders from Dr. Hall, bishop of Bristol, the mayor and corporation of the city presented him to the vicarage | of Temple church. From this he was removed to Newtou St. Loe, a private living in Somersetshire, soon after which, as he himself informs us, he was prompted to undertake a work on “Scripture Chronology,” by reading over the preface to Abp. 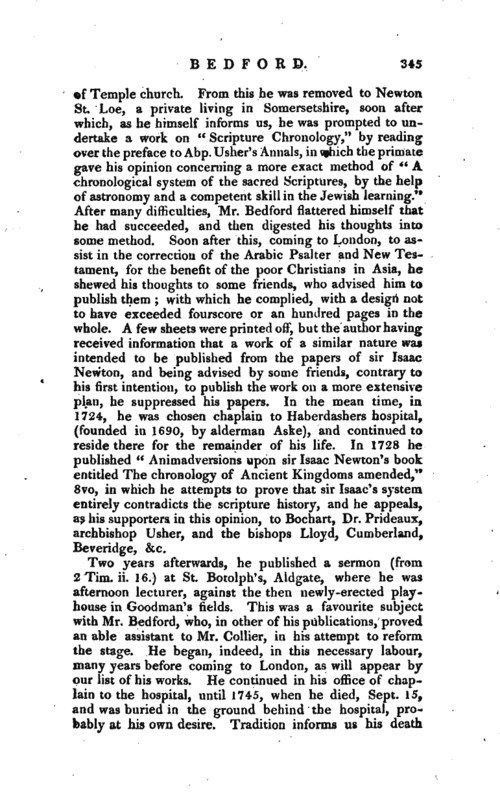 Usher’s Annals, in which the primate gave his opinion concerning a more exact method of “A chronological system of the sacred Scriptures, by the help of astronomy and a competent skill in the Jewish learning.” After many difficulties, Mr. Bedford flattered himself that he had succeeded, and then digested his thoughts into some method. Soon after this, coming to London, to assist in the correction of the Arabic Psalter and New Testament, for the benefit of the poor Christians in Asia, he shewed his thoughts to some friends, who advised him to publish them; with which he complied, with a design not to have exceeded fourscore or an hundred pages in the whole. A few sheets were printed off, but the author having received information that a work of a similar nature was intended to be published from the papers of sir Isaac Newton, and being advised by some friends, contrary to his first intention, to publish the work on a more extensive plan, he suppressed his papers. In the mean time, in 1724, he was chosen chaplain to Haberdashers hospital, (founded in 1690, by alderman Aske), and continued to reside there for the remainder of his life. 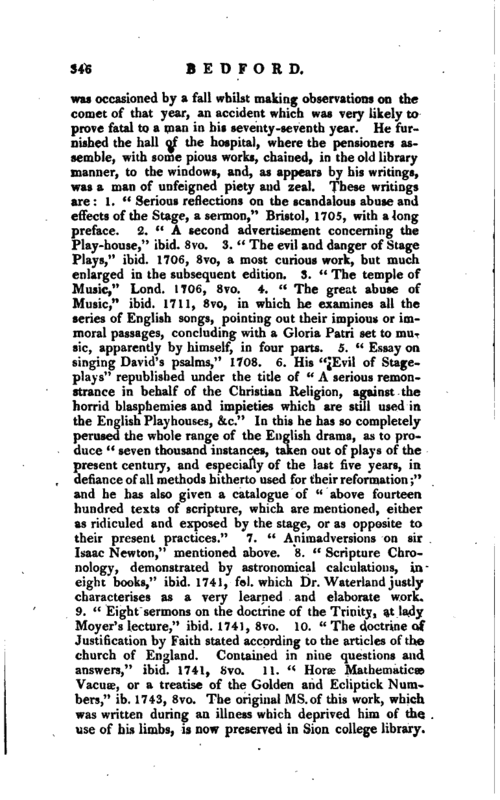 In 1728 he published “Animadversions upon sir Isaac Newton’s book entitled The chronology of Ancient Kingdoms amended,” 8vo, in which he attempts to prove that sir Isaac’s system entirely contradicts the scripture history, and he appeals, as his supporters in this opinion, to Bochart, Dr. Prideaux, archbishop Usher, and the bishops Lloyd, Cumberland, Beveridge, &c.
Ellis’s Hist, of Shoreditch. Republic of Letters, vols. II. III. VI.